If you follow my blog, I'm sure you know my love for pressure cooker. 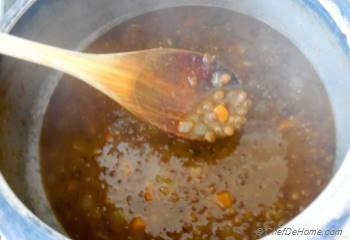 Specially, when it comes to cooking lentils, my first choice is always a pressure cooker. Why? Well! pressure cooker saves time, saves energy, preserves nutrients, plus offers promise of food on dinner table in less than 30 minutes!! What else do we need on busy weekdays?? Nothing!!! right? Just feed the hungry souls with a quick homemade dinner and call it a day! This is when pressure cooker fits right in! 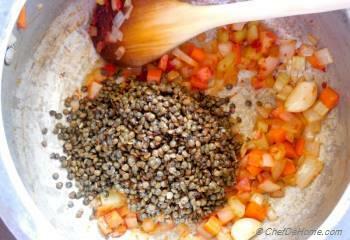 Often, I use french lentils in salads and soups, and always use pressure cooker cook'em. 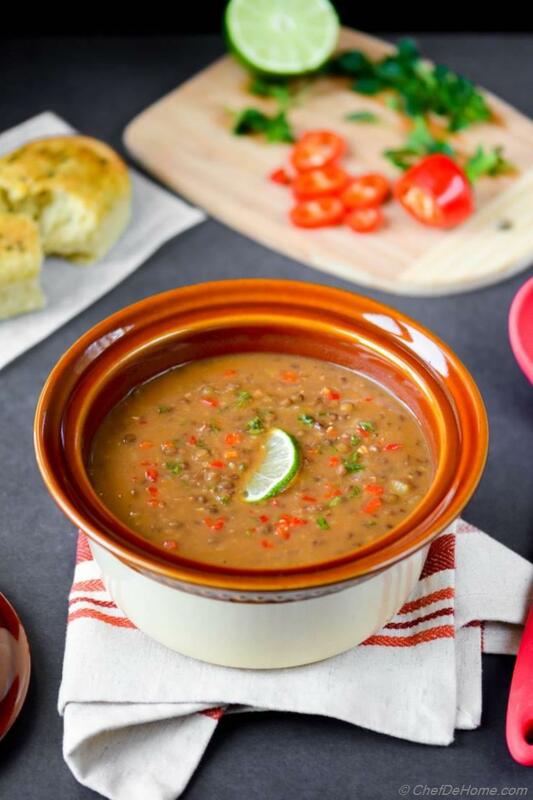 Today, sharing with you, my easy french lentils soup, made from scratch with simple ingredients and in just 20 minutes. That's the promise of "Pressure cooker" my friends! Never more than 20 minutes of cooking and rest you can spend as much as you want for some pizzazz. Often, with pressure cooker cooking, there is also a bonus of one pot meal. 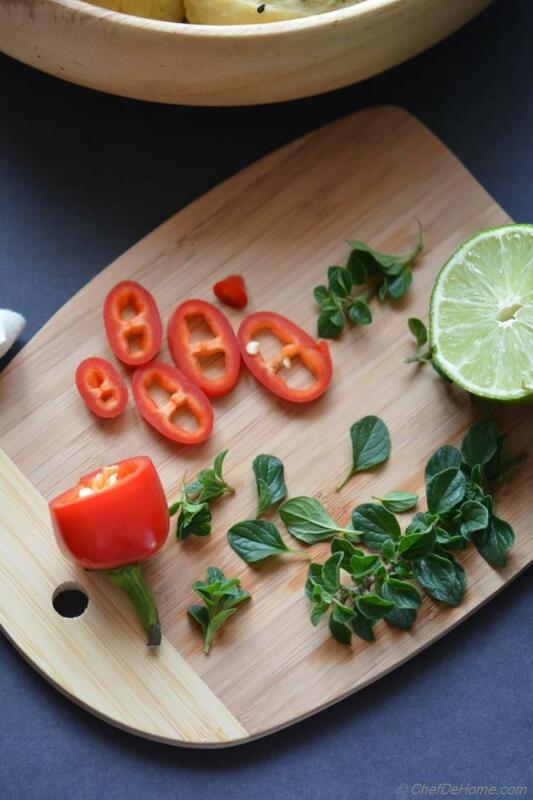 From saute to finishing touch, everything can be done in one pot! No pile of pots and pans to clean after dinner! I'm not going to dedicate whole post to pressure cooker. I'm sure, I have convinced you enough to buy a pressure cooker this year. But if you not planning to buy one, simply cook this easy soup in dutch oven, or in slow cooker. I have provided instructions for both at the end of recipe. Now... on serious note.... this soup is vegan, gluten free, nut free, soy free, low in fat, and yet very filling and flavorful, a comforting winter dinner, indeed! You can portion this soup and freeze to eat it many times a week. Often, if I have leftover and I'm not planning to freeze, then I fry leftovers with steamed rice to make leftover lentil fried rice or lentil cream dip is also one of my favorite way to use lentil soup leftovers. Also, a few words for my delicious dose of oregano and fresno chili pepper in this soup. A little different from classic, this soup is packed with flavor of fresh oreagno and touch of heat from fresh fresno chili pepper. Love love both of these ingredients..... Since I tasted oregano, I can't imagine cooking without it! 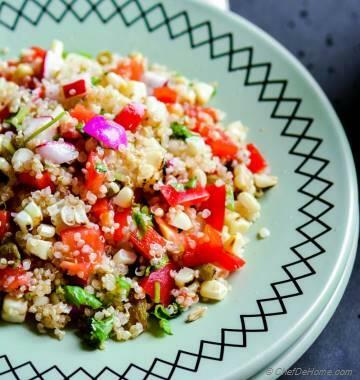 and fresno, the thin-membrane cousin of jalapeno, adds vibrant red color and zing into salsa, soups, and chilies! I'm very happy to share, warm and comforting bowl of soup with you on this cold winter day! Wishing you all very happy Friday! Keep smiling always! A good soup calls for a homemade crusty bread! 1. Heat oil in a pressure cooker pan or dutch oven. Add aromatics i.e. 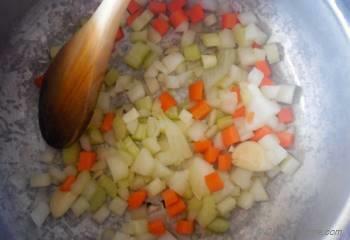 diced onion, carrots, celery, whole garlic clove, and 1 sprig of fresh oregano, then saute until onions are soft. Add tomato paste and 1/2 tsp salt and cook for 1 minute. 2. Now add washed lentils. If you don't like very garlicky soup, you can remove whole garlic cloves at this point. I leave'em in and they just melt-away in the soup. 3. Add 3 cups of water (or stock if using). Bring mix to a rolling boil. Place the pressure cooker lid or place the dutch oven lid.In pressure cooker, cook on medium heat for 12 whistles, about 12 minutes. 4. 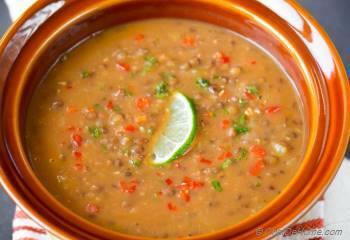 Once lentils are tender, stir in lime juice. Fish out oregano sprig. Taste and adjust salt, also add 1/2 tsp black pepper. 5. 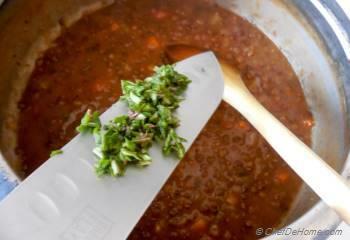 Add remaining fresh chopped oregano leaves. 6. Serve hot with some lime on the side. Garnish with fine minced fresno pepper for some crunchy and peppery bite. Serve bread on the side. 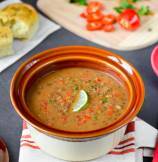 Slow Cooker - To make this soup in slow cooker, add finish first step in small saute pan, then transfer all ingredients to a slow cooker and cook on low for 5 hours, or until lentils are tender. Finish step 6-7 before serving! enjoy! Martin, I apologize for the inconvenience caused by mis-numbered steps. No step is missing, are just mis-numbered. thanks for bringing this to my attention though, I have corrected the numbering! This page doesn't have a step 2, so I'm not sure if I'm missing a step or if the numbers are simply incorrectly labeling the steps. Dedy, thanks! I'm glad you find my lentil soup delicious. Lentils with chorizo sounds tempting too!! thank you so much for stopping by! Damn delicious!!! i just made stewed lentil with saffron and chorizo and served it with quail confit, tempting to try your version of lentil soup!!! Mira, no one can match our grandma's cooking! 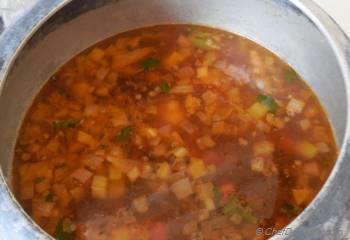 but, yes this lentil soup was really very flavorful! It's impressive that many are making lentils in pressure cooker! I think pressure cooker cooking is talk-of-the-town these days! Thanks, Manali! 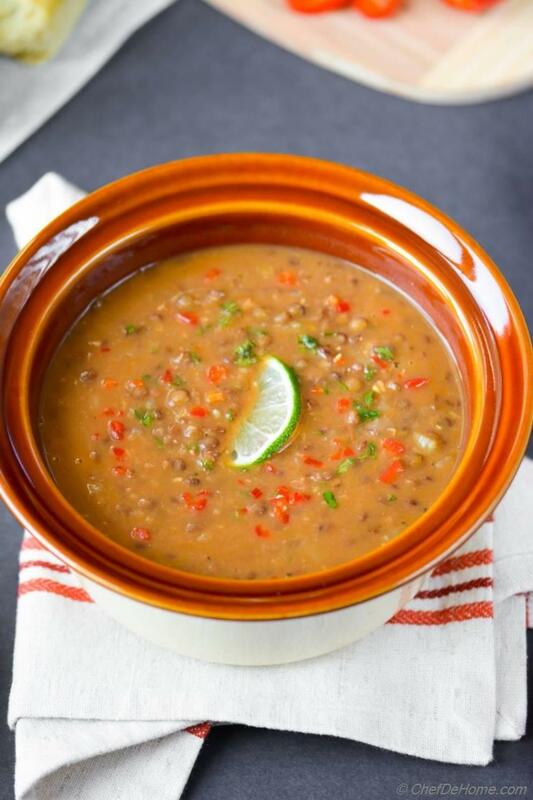 Isn't amazing that lentil soups tastes great even without cream! naturally creamy and vegan, indeed a comforting winter dinner! thanks for the pin! I had lentil soup yesterday for dinner! 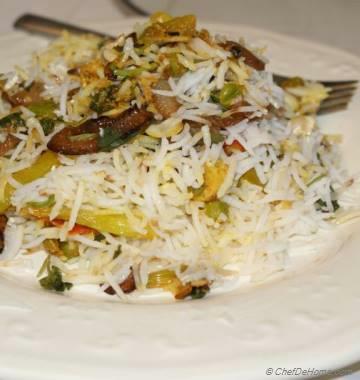 This looks really good Savita, exactly what we crave for in winters..yum! I just saw another recipe for lentils and it was for pressure cooker. 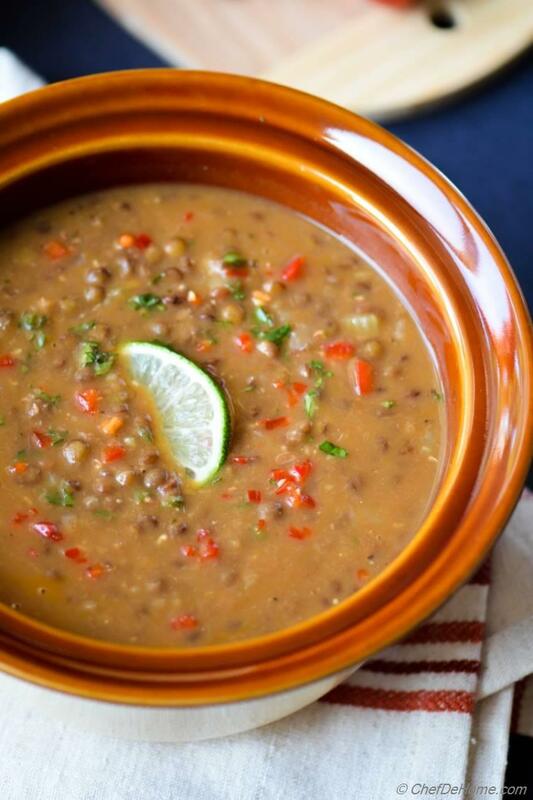 My grandmother always cooks beans and lentils in a pressure cooker and soups are fantastic! Would love to try this flavorful one! Thank you so much, Padma! Love to hear from you! thanks! Gayle! Isn't it cooking with pressure cooker great?! and many thanks for the pin! I so appreciate it! This soup looks absolutely gorgeous! 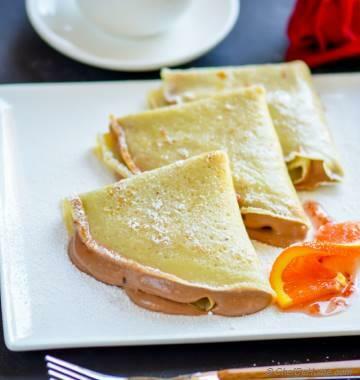 Not to mention delicious, too. This is definitely convincing me to buy a pressure cooker. I love the flavors in here! Pinned!